SoftTree Technologies :: View topic - [9.0.157 BETA] Show rowcount on query execution? [9.0.157 BETA] Show rowcount on query execution? I'm not seeing anything in the SQL Assistant messages or results tab about how many rows were affected or selected aside from scrolling all the way to the bottom of the results pane to get a row count? I could have sworn that was there in 7.x? This is a known issue. It will be fixed soon. There's something still weird here. I take that back, the fetch is the sum of sets. Is there any way to show each operations sets separately? 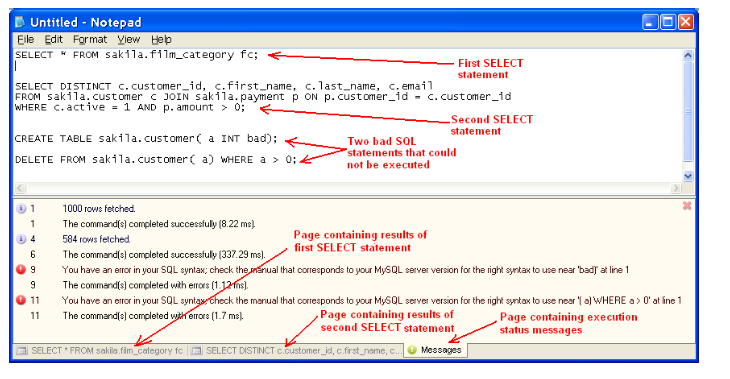 The issue here is missing diagnostic messages for number of rows affected by a SQL statement. In prior SQL Assistant versions they used to be output to the Messages window after code execution. An enhancement introduced in version 7.5 and later enhanced further in 9.0 enables asynchronous printing of diagnostic and progress of work messages returned by the server as the code execution progresses. It also enables executing multiple commands simultaneously from different editor tabs. The mentioned enhancements have solved the issue with waiting for code execution to complete before any messages can be seen, and resolved the issue with fixed output buffer size causing message truncation if many of them are returned. But it also introduced a side effect, not all types of diagnostic messages are printed to the Messages window as of now. We do have a ticket in the system related to that side effect and it's going to be addressed in or before 9.1 maintenance release. I've got a word that this issue is specific to ADO.NET interface for SQL Server. In comparison it does print row counts for all statements executed within a SQL batch when using ODBC connections to SQL Server It's actually somewhat a regression resulting from some changes in version earlier 6.5 made few years ago and accepted at that time. The printing of diagnostic row counts for ADO.NET will be restored in the release planned for the end of this week. I'm still seeing the same behavior with the messages being a 'summary' of the returned results. ADO.net connection type. I am also now seeing that if the statement isn't terminated with a GO it thinks two different select statements come back as "Executed 1 statement; fetched X rows in 2 result sets"
whether there is GO at the end or not, it's still technical a single T-SQL batch statement returning 2 result sets. That's why the status bar message refers to 1 statement and 2 results. SQL Assistant doesn't send to the database engine the first and second SELECTs separately. It sends the entire script, whatever goes between the GO statements or from the beginning of text if there are none. 1 row fetched (0.65 ms). 1 row fetched (0.02 ms). The command(s) completed successfully (0.68 ms). The command(s) completed successfully (0.61 ms). I reopened the ticked and informed the team that the fix is incomplete. Only ODBC interface is returning complete set of messages. whether there is GO at the end or not, it's still technical a single T-SQL batch statement returning 2 result sets. That's why the status bar message refers to 1 statement and 2 results. SQL Assistant doesn't send to the database engine the first and second SELECTs separately. it translates to me that there's a single query but there are two statements. Re: [9.0.157 BETA] Show rowcount on query execution? This issue is specific to ADO.NET interface and it's been fixed in the latest release 9.0.194.